This morning's email brought an impassioned plea from Seth Apter, a year after he posted something similar and this time prompted by the announcement that a store in San Diego where he was scheduled to teach is shutting its doors. Seth's words are an urgent call to action for all who love independent brick and mortar stores like The Queen's Ink: SHOP, he says, and then shop some more. Otherwise, the places where we take classes from people like him, the places where we get personal attention and answers to our questions and find unique items will disappear! We simply have to support our favorite local stores for them to thrive and survive. He makes the case that independent retailers are an endangered species, not to be taken for granted. I'd like to second the notion. 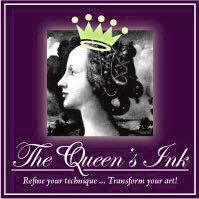 If you haven't been to The Queen's Ink lately, what are you waiting for? Here's the link to his blog post - read it, share it, take it to heart!